My friend Louise (@Weezy77) and I decided to do something rather silly. Since I wasn't really getting round to watching the Alien films on Blu-ray we decided to make an event of it, watch them all one after the other in one day, with beer and lots of bad food. Our initial plan was to watch the original and special edition/director's cut versions of the films from start to finish, six films in all. Sounded great, and in our heads the timings worked, however when we laid them out it was clear a 5am start and an early morning finish just wasn't possible, so we headed for just the four films, but not the originals, the Director's Cut of Alien and the Special Editions of the other three films. Oh, and before you start there are no more Alien films after that. Not yet anyway. You can see from the timings spreadsheet that it just wasn't going to be feasible - you can see the timings on the top half are for the specials with the originals on the bottom, and on the right hand side the time we'd complete if we started at 10am. 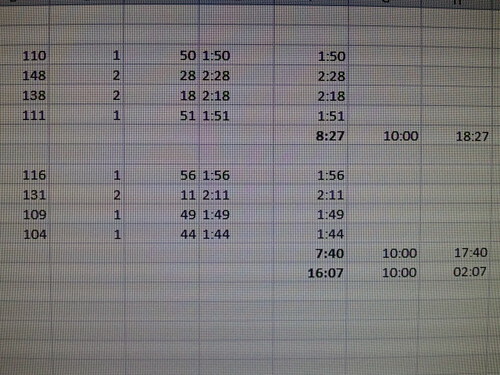 Look at that very last figure to see what a 10am start would have meant if we watched all back to back with no breaks! 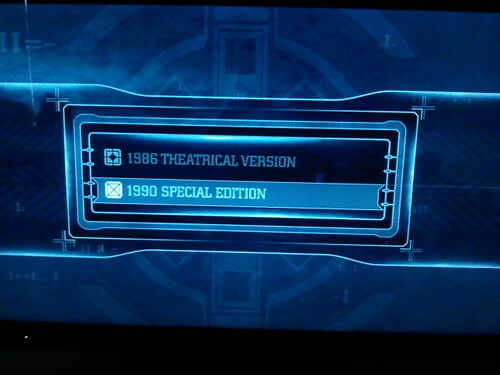 Twitter: Today @weezy77 and I were set to watch all the Alien films and both versions of each back to back. Decided on Special Editions only! 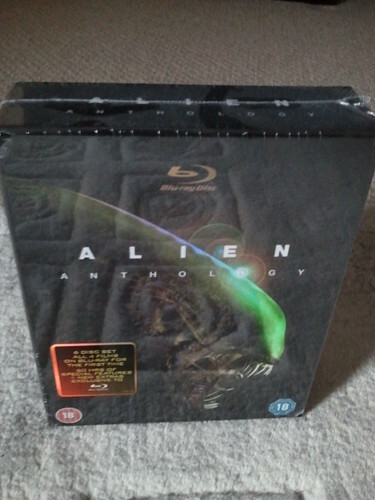 So Alien: Director's Cut from Ridley Scott; Aliens: Special Edition from James Cameron; Alien 3: Special Edition from David Fincher, and Alien Resurrection Special Edition from Jean-Pierre Jeunet was the line up. We began really late. Typical Brunton fashion a big breakfast and settling down meant we didn't really get going until about lunchtime. Twitter: @Snoog: @Filmstalker Was blown away when I got that set. So much content. Me: @Snoog There is, and so well presented too. Me: @IntheFrame1 Looking forward to all the commentaries. 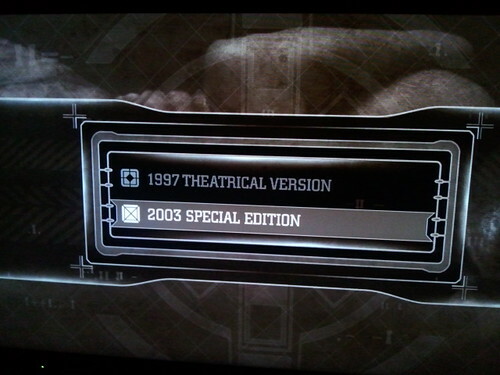 The menus are rather cool for all the films, but the initial choice showed the difference in dates with the original film in 1979, and that's amazing to see it now and think its thirty-three years old, and the Director's Cut released in 2003. Surprisingly this is the only film we watched where it was shorter than the original film. Facebook: First of Alien day. Amazing in Blu-ray saw things I'd never noticed before. Much more colour and tone and the sound is amazing. We noticed the extra scenes that had been dropped in, and a few moments that we'd never seen before because it now looked so much sharper and clearer on Blu-ray. The picture looked fantastic as did the effects, better than the rest of the films to be honest, and the colour depth made me think I was watching a completely different version. It was excellent, apart from one terrible oversight. Twitter: Forgot to mention about Alien:DC and the terrible audio sync issues in the first dining scene, the audio was well out with the picture. QA?! Once we get through the excellent introduction to the ship and we get to see the crew eating together I got a real shock, the audio sync is awful, and I mean embarrassingly bad. I thought I was going to have to adjust the delay from my Amp to speakers, but thankfully it was just this scene. I couldn't believe that had been released to the public and is still on sale. If Ridley Scott saw that I'm sure he'd be mortified. Twitter: Aliens: Special Edition next, Cameron goes long. So next to watch was the Aliens: Special Edition as James Cameron stepped up and we saw the bigger, bolder, Hollywood blockbuster attempt at Alien. I used to love this film, and perhaps as much as I did Alien, but viewing them back to back revealed a number of shortcomings. It's true that the film didn't seem as well brought to life on Blu-ray as Alien had been, and there were a couple of green screen effects shots that could have been sharpened up but were forgivable. For me it was the realisation of how much this reminded me of Terminator, how it copied the false ending idea, and how everything just had to be the Hollywood adage of "bigger and more". Oh it was good fun, but not as much as Alien, nowhere near. Interesting to note that the format isn't so cinematic as the other films in the series. Next to watch was Alien 3, but we needed a break, a food and beer run was called for. Facebook: Toilet and tea break then Alien 3. Me: I would have too. Love that film. I have it on DVD if you'd like a loan? 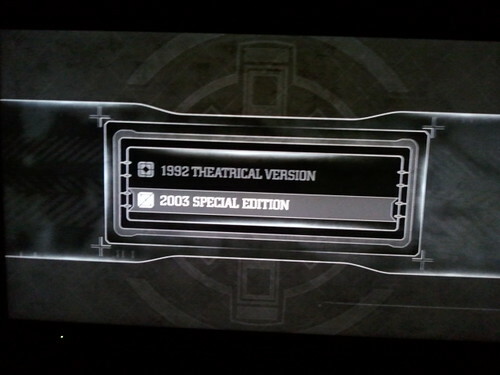 1992 for the original and 2003 for the Special Edition. Was it really twenty years ago? So Alien 3 rolled on, and I remember seeing this again not so long ago and realising how much better it is than I felt at the time. I do remember seeing it and feeling a little betrayed at what they had done with Ripley, but still enjoying the film. After some time had passed I forgave the film for that and on this viewing I realised just how much I liked the idea as well as the pacing and the structure of the film. We were surprised by the opening which was totally different from the way we remembered, opening with much more of the prisoners and a focus on the rescue and investigation of the EEV as well as of Ripley. There were also scenes in the film we don't remember seeing, trapping the Alien and seeing it released again was one, and the ending was definitely different, we remember the Alien bursting out and Ripley holding it, almost hugging it as she fell. I thought all of the differences we saw were for the better, but I'll have to watch the original again to see if it was our memories or real changes. There were some big problems though. For me as embarrassing as the drastically out of sync audio at the beginning of Alien, in Alien 3 on Blu-ray there seemed to be no real attempt to remaster the film, especially with the effects. CG effects had black levels that were multiple shades lighter than the darkness around them, they were much softer in focus, carried a green tinge, and even had a green outline in places. Again I'll use the word embarrassing. At the very least these scenes should have been rectified and made to look better before the release because as they were they looked like amateur effects superimposed on a home system. Twitter: Alien 3 film down and it's now my favourite after Alien. They could have tidied the CG on the Blu-ray, might as well have been in crayon! Me: @Mr_Jonze Yeah, they look really bad on Blu-ray now. @Mr_Jonze: @Filmstalker The alien was a strange stop motion effort in places. Shame, the film itself is amazing. Me: @Mr_Jonze I thought the stop motion wasn't do bad, the straight CG stands out in Blu-ray. No attempt to match colours or levels, awful. @Mr_Jonze: @Filmstalker Yeah, strange coz they went to all those lengths to get the actors to come and re-record some of the dialogue. Overall, despite this, I thought Alien 3 was far better than Aliens in tone, in characters, and in story. It tried to recapture a lot of the feel of the first film, although some don't agree. Me: @perception101 Maybe it is but that doesn't make it better than the third. @perception101: @Filmstalker I'm just amazed, the third one is terrible, was it the theatrical release or the one put together afterwards? Me: @perception101 Aliens is a different format to the rest, which was interesting, it's the loud, brash version that stands out from the rest. Me: @perception101 It's far, far from terrible. Great pacing, strong characters, nice twists. Watched the SE last night for the first time. Well it's all subjective, although I still think Alien 3 fares better than Aliens in the franchise. What do you think? While we were watching we did notice a nice reference to Alien, in the office of the Superintendent you can see one of the bobbing head figures that was on the Nostromos. A nice little touch I thought. We came to the final film late on in the evening, fast approaching midnight, and apart from flagging during Aliens and almost nodding off, the rest of the films had kept me going. I thought Alien Resurrection would be hard going until we got the hard Ripley into the story. Like Aliens, I don't think that this film fared as well as the others on this new viewing. I remember watching it and being excited by Ripley and the way they had taken the character, and I still do love seeing her in mixed genetic mode, but not all the scenes she's involved in aren't as strong as I remember and there seems to be a little too much humour in there for me, or rather for an Alien film, the killing someone with a chest burst was a little cheesy for example. There are some good points though and the underwater sequence was still strong, and there were a lot of great ideas in there, the segregation of the aliens, the way they escape, and the whole set-up of the lab. Ripley is the star though, and the whole genetic storyline really does work well. Then the white abortion appears and this is sillier than anything that's gone before. Me: Absolutely, that was ridiculous. Dropping some of the Whedon humour would have been good too. Ripley was fantastic in it though, best direction for her at that point. Patrick Byrne: Yeah, Ripley had a real edge in that one. Agreed. The final alien ruined it. Twitter: Finished! 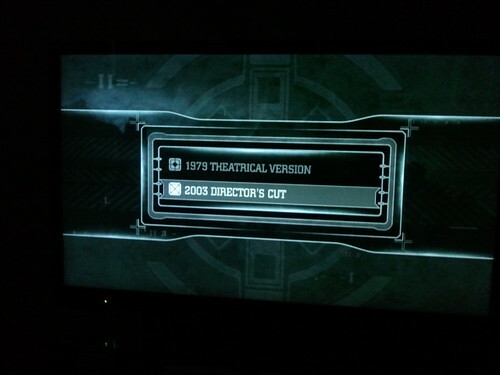 All the Alien films in Director's Cut and Special Editions in one day. Surprised at the ending of Alien Resurrection on Earth. Interestingly there's a closing scene in the Special Edition with both Ripley and the ill-cast Call on Earth looking at an aged Paris, it's a nice finish to the film that I think should have been on the main film, maybe it was a post-credit scene that I missed first time but it's nice to see Ripley back home. Finally. Facebook: You would have thought Ripley would have begun to realise that an Alien always gets on board the ship for a false ending. Every single film! How true that is, for it is only Alien 3 that doesn't have the false ending and the "oh no there's an Alien on the ship and we didn't realise...again" moment. It's something that we conveniently forget when we watch the films but watched back to back it's a ploy that stands out like a sore thumb. Alien day was great fun for us and we're thinking about picking another franchise to do next, but for the Alien franchise I have to say it was a pleasure to watch them all, even with the poor Blu-ray offerings for some of the films, watching them has fuelled my desire to see the originals and hit those audio commentaries and extras, and there are a lot in this box-set. For the franchise I'd have to rank them in the following order: Alien: Director's Cut; Alien 3: Special Edition; Aliens: Special Edition, and Alien Resurrection: Special Edition at the rear, still there's not a lot in them. Have you seen the Alien films recently?